Last week I finally picked up my old Canon AE-1 Program that I had bought on ebay a few years ago for very little money. For some reason I had been thoroughly freaked out about the thought of loading film that it took me all this time to actually try out the camera. But finally my curiosity won over the fear and I got the film in the camera, shot a whole 36-exposure roll in one day and sent it off to be developed and scanned the next day. I expected to either love or hate the results. I wanted to love it, but feared that I would hate it. You, know, the lack of instant feedback with digital cameras that I’ve grown used to, it’s not there with film, you have to think carefully before you compose a shot. I feared that it would reveal everything that I have yet to master in photography and make me feel like I have no idea what I’m doing. But then I saw the photos, and I fell in love. 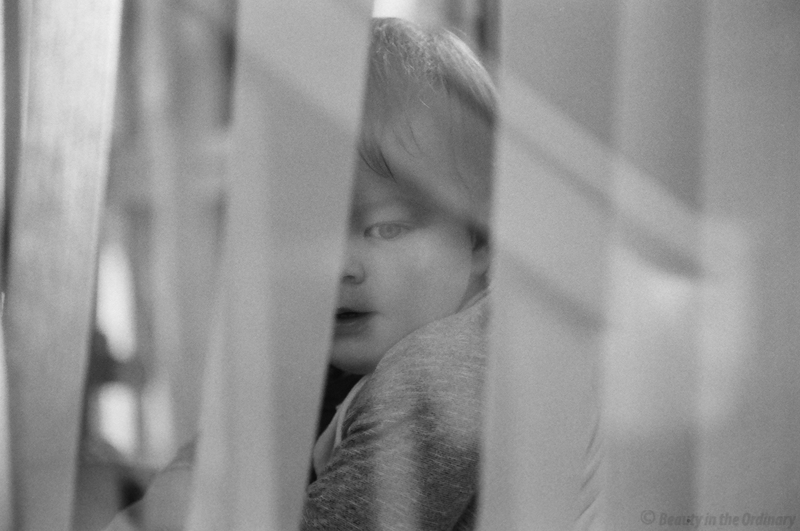 I even love the grain of the Ilford Delta 400 film that I used. There is something truly beautiful and “authentic” (for the lack of a better word) about black and white film. I was somewhat frustrated with the camera though. There is no manual exposure option, although there is a version of shutter priority mode which you can sort of turn into aperture priority mode, the latter of which I discovered after I had shot that first roll of film. 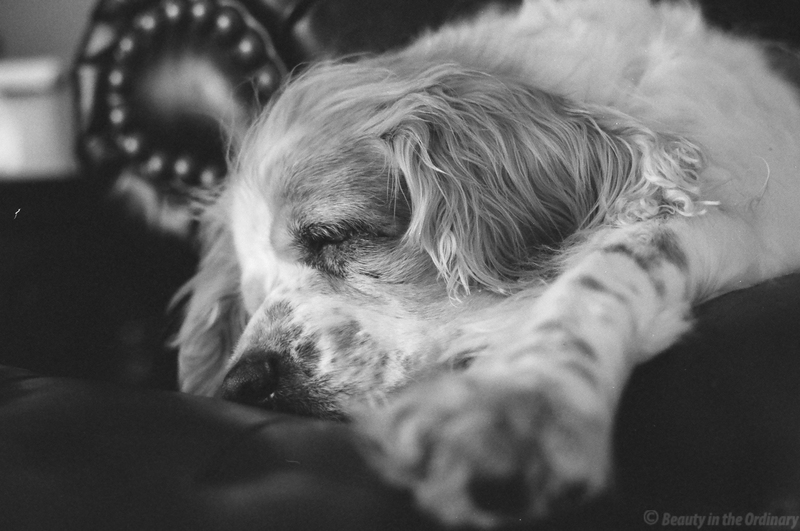 This photo of one of my dogs is probably my favorite shot out of the 36 frames. Not all of them had the same slightly muted look – it seems like the wider the aperture of my Canon FD 50mm f/1.8 was, the more muted the colors turned out to be – but I really like the slightly muted look. I was also lucky to nail the focus on this shot. The mirror of my camera has a crack straight through the middle which makes focusing a bit more difficult than it would be otherwise. And here is my second most favorite shot, once which I thought would be really cool already when I took it, although I may be alone in thinking that. I was taking photos of my kiddos in the sunroom when one of my dogs (the one not pictured above) wanted to go out. I let him out in the back yard and happened to look in to the sunroom from the outside and saw my baby boy sitting on the other side of the glass playing with the blinds in the sunroom. What I saw transferred into the perfect photograph in my head, and I really like the end result – not as a photo of my baby boy, but rather as an artistic expression.